The post Why Is Your Dog Peeing on the Bed? Taking a Look at Hormone-Responsive Urinary Incontinence by Dr. Eric Barchas appeared first on Dogster. Copying over entire articles infringes on copyright laws. You may not be aware of it, but all of these articles were assigned, contracted and paid for, so they aren’t considered public domain. However, we appreciate that you like the article and would love it if you continued sharing just the first paragraph of an article, then linking out to the rest of the piece on Dogster.com. I recently received this question by way of Facebook about a dog peeing on the bed: My dog is potty trained and very good about going outside or tapping me to let me know she needs to go out. However, there’s been a recent bout of her wetting our bed. She often sleeps in bed with us and wets it when we aren’t in the bedroom. — Jennifer. Two key words — “she” and “bed” make me very suspicious that Jennifer’s dog is experiencing a syndrome called hormone-responsive urinary incontinence. The syndrome is common in middle-aged, spayed female dogs, but it also can develop in younger or older female dogs; it rarely has been reported in males. What Is Hormone-Responsive Urinary Incontinence and Why Does It Result In a Dog Peeing on the Bed? Is your dog peeing on the bed — whether it’s her bed or your own? Photography ©ZoonarRF | Thinkstock. Hormone-responsive urinary incontinence typically manifests as urine dribbling, which can mean a dog peeing on the bed. The dog usually is not aware that she is soiling the house, and the issue is not a behavioral problem. Dogs with the syndrome do not purposefully urinate in the house, and dogs with the syndrome have not lost or forgotten their house training. Rather, they are not able to hold their urine, and it leaks out involuntarily. Urinary leakage is most likely to occur when the dog is resting or sleeping and not actively thinking about trying to hold urine in. Therefore, bedding is the most commonly soiled household material. Dogs who are mildly affected with the syndrome typically wet only bedding, and they don’t suffer from incontinence every day. More severely affected dogs may dribble urine continuously wherever they go. How Common Is Hormone-Responsive Urinary Incontinence? I mentioned above that one of the main reasons for a dog peeing on the bed, hormone-responsive urinary incontinence, is common. In fact, extremely common might be a better way to put it. Some resources indicate that up to 20 percent of spayed female dogs experience (“suffer” is not an appropriate term, because most dogs with the condition aren’t aware that they have it) the syndrome. The mechanism of the syndrome is not completely understood, but it appears to be related to the urethral sphincter, a circular muscle that, when contracted, prevents flow of urine out of the bladder. It appears that estrogen helps to potentiate the activity of the sphincter in females. Spay surgery involves removal of the ovaries, which are the body’s main source of estrogen. The decreased estrogen levels then predispose the urethral sphincter to be more relaxed, which allows urine to dribble out of the bladder. This will be especially common when the dog is relaxed and not thinking about her sphincter. Older individuals tend to have weaker sphincters (which is something we all can look forward to in the future), so the syndrome becomes more common with increasing age. How Is Hormone-Responsive Urinary Incontinence Treated? Hormone-responsive urinary incontinence is common in middle-aged to older female dogs, and can cause issues like a dog peeing on the bed. Photography by Marilyn D. Lambertz/Shutterstock. Since the condition is linked to low estrogen levels, one might think that the treatment would involve estrogen supplementation. In fact, synthetic estrogen (in particular, a compound called diethylstilbestrol, or DES) historically has been used to treat the condition. However, you may recall that there was quite a fad for prescribing estrogen in humans. Estrogen pills routinely were prescribed for women going through menopause, until a large study found that they did more harm than good. It turns out that hormone replacement is a very tricky undertaking. Natural hormone levels fluctuate throughout the day, and they are balanced by a number of feedback mechanisms. Simply pumping estrogen into a person’s body is not without risk. Therefore, although DES can be used (and, in certain circumstances — especially refractory cases — still is used) to treat hormone-responsive urinary incontinence, it generally is not a first-choice treatment. In particular, DES has been linked to blood cell problems that, if not detected, can be life-threatening. The first-choice medication for treatment of hormone-responsive urinary incontinence is a medication called phenylpropanolamine, or PPA (I have seen many clients snicker when they learn that the treatment for the condition sounds like the word “pee pee”). PPA is not a synthetic estrogen. It is more closely related to adrenaline, which is in a category of substances called catecholamines. PPA once was widely used in humans as a weight loss medication — it was the active ingredient in Dextrim. In humans, the product has been linked to a possibly increased risk of stroke. No such link has been found in dogs. PPA is still available for dogs, although the US Drug Enforcement Agency, in its rabid (and utterly ineffective) attempts to eliminate methamphetamine from the world, sometimes threatens to reduce its availability (PPA can be used in the making of methamphetamine). For now, however, the product remains available for veterinary use. Although the above paragraphs may make PPA sound scary and dangerous, most dogs do not experience any side effects from the medication, and there are no common long-term health risks associated with PPA use in dogs. Most dogs who take it simply stop dribbling urine or wetting the bed and otherwise go on with their lives. Although PPA usually is safe, as with any chronic medication I recommend using the minimum effective dose. Some dogs with hormone-responsive urinary incontinence do not require PPA every day. Some dogs experience incontinence in an intermittent fashion, and require the medication only a few times per year. Other dogs grow out of (or into) their incontinence. The medication should be used only as needed. 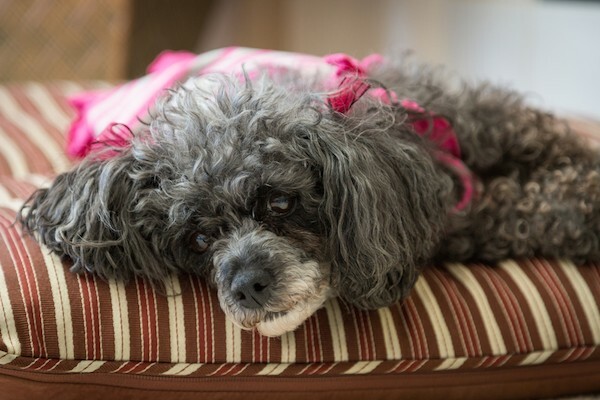 Jennifer, a dog peeing on the bed will likely stop if you treat her with PPA. But before you do, I recommend that she undergo blood and urine testing. Sometimes other medical conditions, such as bladder infections, diabetes, kidney disease, and certain glandular disorders, may result in a dog peeing on the bed. If she tests negative for these conditions, then she likely has hormone-responsive urinary incontinence. 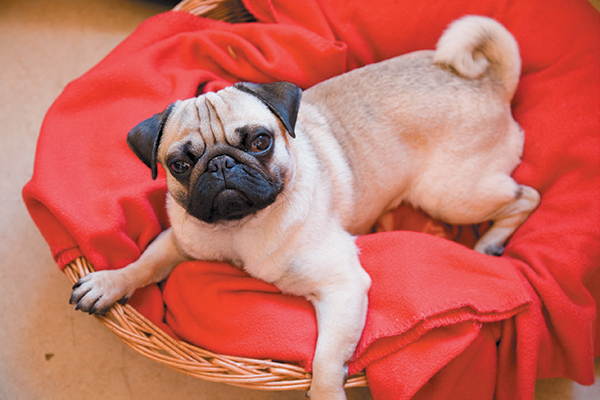 Tell us: Is your dog peeing on the bed? What was the issue at hand?